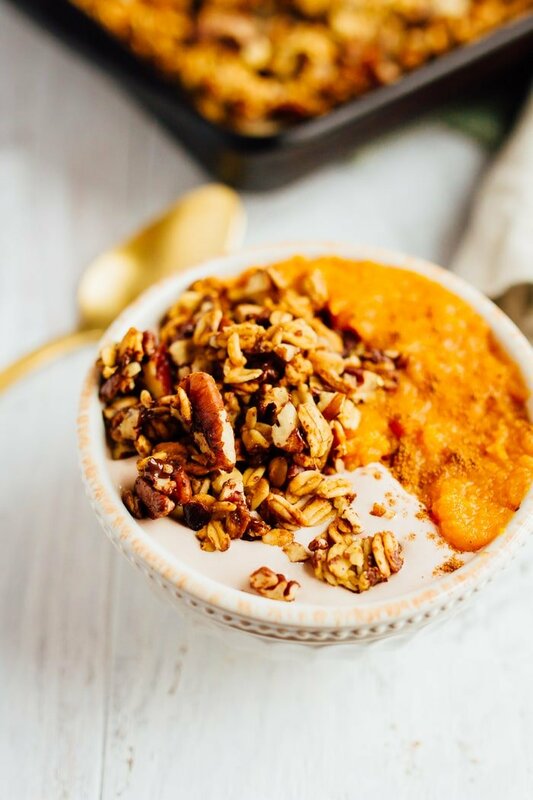 This recipe for homemade chocolate pecan pumpkin granola is loaded with nutty pecans and studded with mini chocolate chips for the perfect hint of chocolatey goodness. Vegan + gluten-free. There’s really nothing better than making a big batch of homemade pumpkin granola on a fall day. Not only does it make the house smell amazing, but it’s so awesome to have on hand for snacks throughout the week. Isaac is on the road a ton and we’ve found that granola is an easy snack option that he can take with him in the truck. 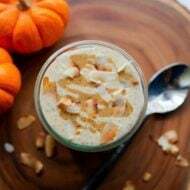 He can use it as a topping for yogurt, eat it by the handful when things get busy or add granola to a jar of peanut butter and eat it by the spoonful. The granola peanut butter trick is somewhat of a new thing he’s been doing. I’ve had peanut butter and granola together — mainly as a topping for yogurt and smoothie bowls, but I’ve never poured granola into a jar of nut butter and eaten it with a spoon. Not going to lie, it sounds amazing so I’ll have to try it soon. 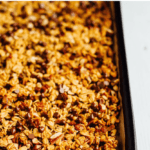 Anyhow, given the granola snacking situation we have on our hands, I’ve been making more granola at home and this recipe is my latest creation. 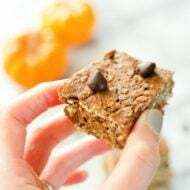 I love the combo of pumpkin, maple and pecan on it’s own, but the chocolate chips give the granola a little hint of extra sweetness and make it tad more decadent. You add them to the granola right after baking, while the oat mixture is still warm, so they get melty and coat the oats and nuts a bit. It can get a little messy, but it’s so worth it! 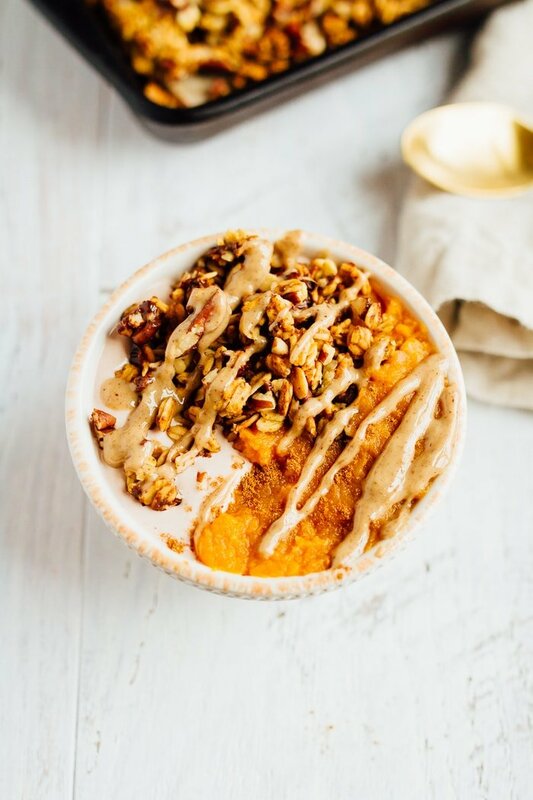 If you really want to get the full pumpkin granola experience, I highly recommending making this pumpkin pie yogurt bowl with yogurt, pumpkin puree, homemade granola and a drizzle of nut butter. It’s SO good! Preheat the oven to 325°F. Line a rimmed baking sheet or baking stone with parchment paper. Spread mixture onto the prepared baking sheet. Bake in the center of the oven for 40-50 minutes or until oats are golden brown, dry and crisp. 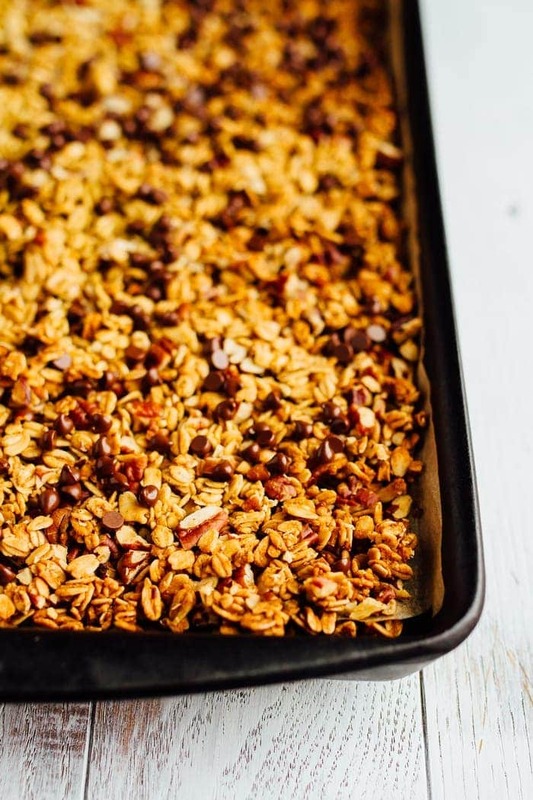 Allow the granola to cool for about 5 minutes, then sprinkle the chocolate chips over granola while it continues to cool. The chocolate chips will melt a bit. Once granola is completely cool, transfer to an airtight container (I use a mason jar) and store in a cool place. I like keeping mine in the fridge so it lasts longer and stays extra crunchy. 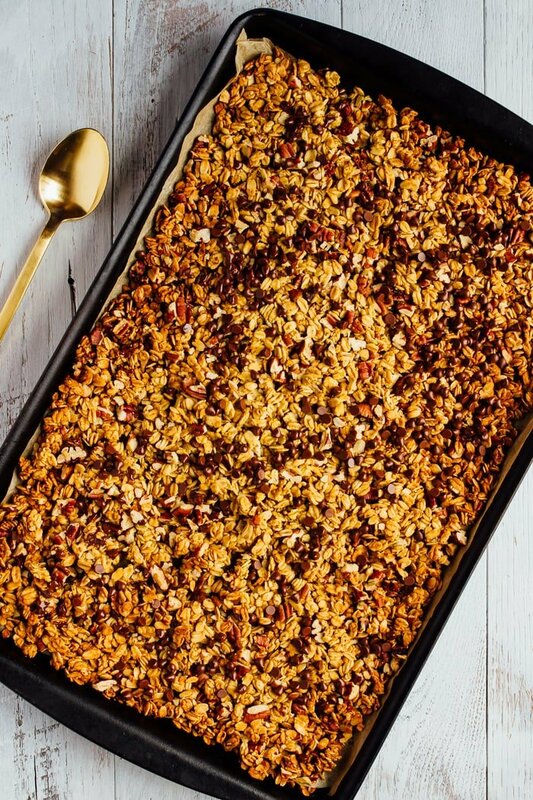 If you make this chocolate pecan pumpkin granola let me know how it turns out in the comment section or share a photo on social media. Just be sure to tag me (@eatingbirdfood + #eatingbirdfood) so that I see it! Looks like a great event! The granola looks delicious. I definitely prefer making granola over buying it…store bought is always way too sweet for me. What a fun evening! Wine, good food, and cute dresses. Gotta love those nights out. The granola sounds incredible!! I love making my own granola but I never seem to have the time. You’ve got me craving granola now…munch, munch. Home-made granola is soo good! So cool that you guys won haircuts; sounds like that will be so fun! A beautiful bowl of homemade granola, a lovely event in an idyllic spot, and a STUNNING girl to top the post off. Thanks for sharing your experience with us. I wish I could have attended. And congrats on winning! What a wonderful evening! 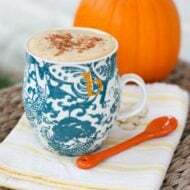 And…you know I am loving the pumpkin goodness! YUM! 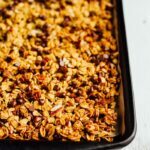 I’ve never made granola and I love your fall take on it! Wine frappe – intriguing. I’ve considered making wine smoothies before (and vodka smoothies, to be honest). Always looking for new ways to imbibe! I remember making granola for the first time last year and realizing how easy it was! I had to re-read that sentence about three times before realizing that you weren’t going to be featured in Elle magazine. I must still be in ‘work’ mode…. Looks like a good ol time to me! I am all over that granola too. Looks great! Yea for you!! Congrats on the Food n’ Wine!! So exciting.. I love making my own granola, but i haven’t done it in so long! I need to do it asap ! Your pictures from this event is gorgeous and I love that black dress. Do you think this recipe would still taste right without the wheat germ? I cant have gluten, I was thinking of making the recipe exactly the way you have it minus the germ? Any thoughts? I’m so excited to make this. We just started my oldest son on a gluten free diet and he loves granola. I think he will have fun making it with me! This looks so good! I really need to get into making my own granola vs always buying it! Made this today and it is wonderful except for the fact that 40 minutes in my oven was too long as the granola burned and has a slightly funky flavor now. Otherwise, absolutely love this recipe and will definitely make again, but probably bake for 30 minutes! I made the chocolate pecan pumpkin granola and it was delicious! So easy and made the house smell wonderful. I have to make it again because it disappeared before I could get a picture. Love love love your recipes!